TruTrack effectively “freezes” the retina, allowing you to capture the precise OCT image you want, even if the patient blinks or moves. Your patient is comfortable and you are confident. 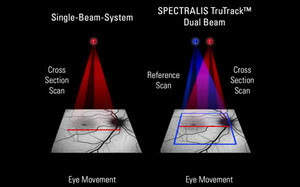 The SPECTRALIS ability to track the eye live is very valuable in providing reliable follow-up data. When I see a change I can rely on it being perfectly matched to previous images. This is particularly helpful in patients with poor cooperation.